World Barista | Where there is air bubble in your tongue, there is no espresso. The graph above is what’s called a “Brewing Control Chart”, the key to making whatever coffee you’re using taste as good as possible (and not to mention getting all the flavor you’re paying for into the pot). It may look a little confusing at first, but a little study will clear that up and there’s a worthwhile payoff for your time spent understanding the brew process. On the left is plotted the strength of the brewed coffee, along the bottom is the extraction, and the diagonal lines in red indicate the brew ratio, the amounts of coffee and water you’re brewing with. To use the SCAA brew control chart below, you need those three basic measurements — the weight of ground coffee in the brew basket, the volume of water poured over that ground coffee, and the strength of the brewed coffee — and then you can plot these to determine the extraction. The objective, of course, is get into the ‘Optimum Balance’ area. Way back in the 1950′s, the Coffee Brewing Institute, under the direction of Prof E. E. Lockhart at MIT, asked a lot of coffee drinkers their preferences and determined that there was indeed an optimum balance of extraction and strength. The SCAA repeated this survey at one of their annual conferences and confirmed the people’s preference is still about the same today, at least if you’re American and the coffee is roasted medium. There is a difference for dark roasted coffee — it tastes stronger than medium roast — and Europeans like stronger coffee (but at the same extraction). Here, ‘strength’ means how much of the coffee beverage is actually coffee, so 1.25 on the scale above indicates that 1.25% of what you’re drinking are coffee solids dissolved in the water. ‘Extraction’ means what fraction of the original dry ground coffee has ended up in your cup. For example, if you start with 5 oz of ground coffee, and 1 oz dissolves during brewing, then the extraction is 1/5 or 20%. The red diagonal lines show how much coffee you started with — for example, the line labeled 3.75oz (106 grams) means you put that much ground coffee into the brew basket. 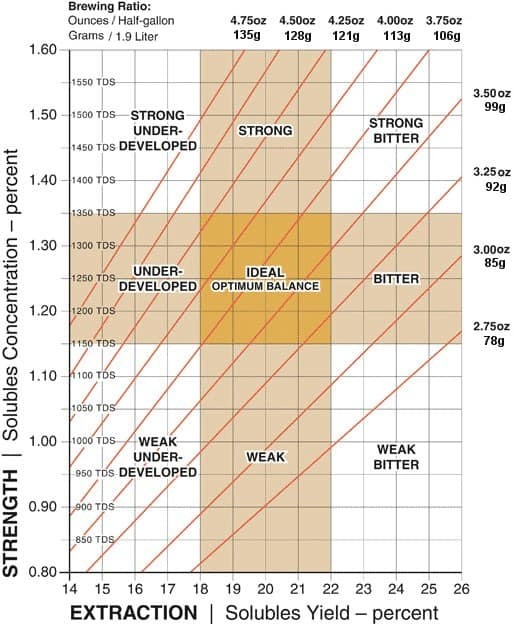 On this particular chart, the brewing formula always assumes 1/2 gal (1.9 liters) of hot water with each coffee weight. Remember that the brew chart applies to the actual amount of water you pour over the coffee grounds. If you want to end up with 64oz of brewed beverage, you’ll need to start with more water — about 70 oz in this case. To maintain the 4oz/half gallon ratio, you would need to increase the weight of coffee to (70/64) * 4oz = 4.37 oz. A complete brew analysis looks also at the temperature of the brew water and how long the water is in contact with the coffee, and includes assessments of how fine or coarse the coffee is ground, the bed depth of ground coffee in the brew basket, and how well the spray head is wets the grounds. My love affair with Intelligentsia coffee began a few weeks ago, when a friend of mine checked in to it on Foursquare, a location-based social network, when he was in Los Angeles on a business trip. That sent me off on a search that was only possible in the information age and I’ve been hooked ever since. A coffee lover but not an expert, I had never heard of the coffee brand before. The name that I only knew as a term dating back to the Russian communist era was highly intriguing. Immediately afterward I rang up my sister, who was visiting Palm Springs, California, at the time, and asked her to visit the coffee house’s Pasadena branch, buy me two bags of beans – the Black Cat classic espresso and the Anjilanaka – and bring them back to me here. Ever since their arrival a few days later I have started my morning with the Anjilanaka blend, an organic coffee from Bolivia that has a fruity aroma and sour aftertaste. And luckily, my disappointment didn’t last long. Chan’s Espresso serves another quality coffee brand called Tim Wendelboe, which is from a micro roastery of the same name based in Oslo, Norway. Chan’s Espresso also serves a blend that Park buys from a coffee guru living outside Seoul. Still, bags of Intelligentsia and Tim Wendelboe beans were on display and for sale at Chan’s. Asked if there was any reason why he’d chosen the two foreign coffee brands, Park said nonchalantly that they were the only two out of a dozen brands that agreed to his export offer. A former photographer, Park wasn’t originally a coffee lover. He said he still isn’t sure if he is crazy about drinking coffee. But this is his first business, which he started in late 2009 when he was on temporary leave from his job, and he said he wanted to do well. He said he is still learning about coffee from the aforementioned guru and that his goal is to one day serve coffee made from beans he has roasted himself. As part of that goal, he has equipped the shop with expensive, top-notch machines and gadgets – from espresso and drip coffee machines to grinders, water purifiers and a beautiful orange vintage Italian refrigerator. Chan’s Espresso lives up to its identity as a coffee bar and serves no other drinks or desserts. It focuses strictly on coffee, just the way Park said he likes it. Shifting weather patterns have led to lower bean yields and higher prices at coffee shops. A mile above this rural mountain town, coffee trees have produced some of the world’s best arabica beans for more than a century. Now, farmers are planting even higher — at nearly 7,000 feet — thanks to warmer temperatures. “We noticed about six years ago, the weather changed,” said Ricardo Calderon Madrigal, whose family harvests ripe, red coffee cherries at the higher elevation. He sells beans to some of the most notable coffeehouses in the U.S., including Stumptown Coffee Roasters of Portland, Ore., and Ritual Coffee Roasters in San Francisco. Standing among healthy coffee trees near the upper reaches of his farm, Calderon said he knows he is lucky. Calderon is one of the few Costa Rican coffee farmers benefiting from the shifting weather pattern, while most of his fellow growers have found themselves on the losing end. Many long-established plantation owners have seen trees wither or flower too early. Some have given up. Others are trying to outwit changes in temperature, wind and rain with new farming techniques and hardier tree varieties. Like many tropical crops, coffee cannot tolerate extreme high and low temperatures, and it needs dry and wet seasons. Costa Rica and other countries, such as Colombia, with sophisticated coffee farms and mills, appear to be noticing the effect of climate change first. These problems are helping to push up the price of a latte or espresso at coffee shops everywhere. Most important, the fate of coffee in Costa Rica could be a bellwether for food production — and prices — globally, as farmers around the world cope with mudslides, droughts and creeping changes in temperature. Almost all coffee grows in the tropics, and in general, tropical species are more sensitive to climate change, said Joshua Tewksbury, the Walker professor of natural history at the University of Washington. There are more species there, they can withstand only a narrow band of temperatures and they are not likely to adapt well to change. Heavy rains in Colombia recently helped drive coffee beans to prices not seen in more than a decade, and coffee companies are watching closely. Last fall, Starbucks raised prices on some drinks to offset rising costs on commodities, notably coffee. A pretty cup from Espresso Cielo in Santa Monica. Intelligentsia’s founder, Doug Zell, told us in 2009 that “LA got a later start in terms of the very best coffee can offer, but they seem to be embracing it with the religious zeal of a convert.” The conversion didn’t happen overnight, but the good word has finally spread. Coffee aficionados are no longer confined to Espresso Profeta, Caffe Luxxe orConservatory for Coffee for a decent cup of joe. Over the last two years, “third-wave coffee shops” have opened their doors. These specialty coffee shops brew small-batch coffee beans, train their baristas in the art of pulling an espresso shot and serve espresso drinks the way they were meant to be enjoyed (read: no 31 ounce coffee monsters here). Those who fret at the mere thought of Starbucks buying Peet’s need not worry: You can only go up from here. Here are 10 specialty coffee shops (plus two honorable mentions), heading west to east, where you can get a damn good cup of coffee. 1. Espresso Cielo: Sure, the stretch of Main Street between Santa Monica and Venice has a few coffee shops (Urth, Peet’s-potentially-Starbucks), but keep going towards Venice until you happen upon this blue tinged-shop. It’s French by way of Canada. Serving coffee in distinctly blue cups, Espresso Cielo offers coffee from Vancouver’s 49th Parallel Coffee Roasters, one of the very few cafes outside of Canada to do so. 3101 Main Street, Santa Monica; (310) 314-9999; http://www.espressocielo.com. 2. Balconi Coffee Company: When Cafe Balcony lost its lease in a tucked-away spot at Centinela and Rochester in 2009, broken-hearted lovers of siphon-brewed coffee cried coffee-stained tears. Ray Sato re-opened his coffee shop earlier this year in this new location at Olympic and Sawtelle, much to the relief of his fans. Sato plans to offer a few beans at a time. On a recent visit, he was brewing beans from local roaster Cafecito Organico. Word to the wise: Sato wants to focus on the social aspect of coffee culture, sothere is no wifi here. Take that as your sign to disconnect and re-connect. 11301 W. Olympic Blvd #124, Los Angeles; (310) 906-0267;http://www.balconicoffeecompany.com. 3. Coffee Commissary: Coffee Commissary’s décor is minimalist, allowing you to focus on the coffee. And what great coffee: one of the few places in LA that offers Portland’sCoava Coffee Roasters, the shop also offers coffee from Sightglass Coffee and Victrola Coffee Roasters. Coffee Commissary is located right next to soon-to-open butcher shopLindy & Grundy, so it’ll likely become a two-shop stop when you visit. 801 N. Fairfax Ave., #106, Los Angeles; (323) 782-1465; http://coffeecommissary.com. 4. Farmers’ Markets: If you can find Starbucks at Vons, it’s only fitting that you can find an artisan coffee stand at your local farmers’ market. DripBar is a simple stand: two girls, a coffee cart, a few bags of San Francisco’s Blue Bottle Coffee beans and a few Hario V60 cones for pour-overs. Find them at the farmers’ market on Crenshaw, in Los Feliz and on the USC campus. Longshot Coffee was started by Mark Baird, who wanted to introduce us to the art of Australian espresso. He primarily caters to Hollywood sets and events, but starting April 7, you’ll be able to find Longshot at the Yamashiro Farmers’ Market in Hollywood. 5. Cafecito Organico: Cafecito Organico is one of the few coffee shops in LA to source and roast its own coffee. Its beans are carefully selected from sources who engage in sustainable, fair practices. Cafecito has two locations; the second one, on Heliotrope between Scoops and The Bicycle Kitchen, is the more coffee shop-py shop of the two, with plenty of seating. In both locations, the baristas can wax poetic about how South American coffee differs from, say, Indonesian coffee. 534 N. Hoover St., Los Angeles, (213) 537-8367. 710 N. Heliotrope Drive, Los Angeles, (213) 305-4484.http://www.cafecitoorganico.com. ​6. Spring for Coffee : To say that Spring for Coffee is small is a bit of an understatement. It’s all of 200 square feet, a tenth of the size of the 2,000 square feet CoffeeBar just a few doors away. Where CoffeeBar’s generous space invites you to stay, Spring for Coffee understands that you’re busy and need to go. Each cup is individually crafted, and you have your pick of coffee, including beans from Portland’s Stumptown Coffee Roasters and San Francisco’s Ritual Coffee Roasters. 548 S. Spring Street, Los Angeles; (213) 228-0041; http://www.springforcoffee.com. 7. CoffeeBar: CoffeeBar is Intelligentsia without the pretension, Seattle without the rain (present weather excepted). This is is truly a coffee bar: the shop judiciously features multiple roasters so that on any given day, you can have your pick of specialty beans on tap. Recently, the shop had beans from Noble Coffee Roasters, Verve Coffee Roasters and Four Barrel Coffee. Oh, and CoffeeBar happens to have a very rare Slayer espresso machine, an$18,000 beast that, in the hands of the right barista, may give you the best shot of espresso you’ve ever had. 600 S. Spring St., Los Angeles; http://www.coffeebarla.com. 8. Intelligentsia: With the exception of the aforementioned Espresso Profeta, Caffe Luxxe, and Conservatory for Coffee way over on the Westside, Los Angeles was arguably a coffee wasteland until Chicago’s Intelligentsia rolled into Silver Lake. The shop also has locations in Pasadena and Venice. For those who can’t make it out to any location (or for those whose conversion is so recent they prefer not to deal with Intelligentsia’s often holier-than-thou vibe), The Fix in Echo Park and Paper or Plastik in the Mid-City area all brew Intelligentsia beans. 3922 West Sunset Boulevard, Los Angeles, (323) 663-6173. 1331 Abbot Kinney Blvd., Venice, (310) 399-1233. 55 E. Colorado Blvd., Pasadena, (626) 578-1270. 9. Cognoscenti Coffee: When Yeekai Lim left his pop-up coffee stand at Blue Dot Acai & Yogurt in Eagle Rock and set up shop inside Proof Bakery in Atwater Village, most of his loyal customers followed him — with good reason. An architect-turned-barista, Lim is almost obsessive about details. Ask for a cortado and talk to him about how he decided which milk to use for his drinks. Cognoscenti brews beans from San Francisco’s Four Barrel Coffee. 3156 Glendale Blvd, Los Angeles; (323) 664-8633; http://www.twitter.com/cogcoffee. 10. Cafe de Leche: Cafe de Leche is either the harbinger of gentrification or a much needed artisan coffee shop in Highland Park. Brewing beans from Stumptown Coffee Roasters, the shop offers the staples (lattes, macchiatos) as well as neighborhood specials like the horchata con espresso. 5000 York Boulevard, Los Angeles; (323) 551-6828; http://www.cafedeleche.net. Bru Coffee Bar : The coffee shop formerly known as Psychobabble in Los Feliz brews beans from Ritual Coffee Roasters on its La Marzocco machine. The shop is still young, the shots are a bit uneven and the latte art needs work, but give it a few months and it will likely be a contender. 1866 Vermont Ave., Los Angeles; (323) 664-7500; http://brucoffeebar.com. Gelato Bar: While not strictly focused on coffee (it’s called Gelato Bar for a reason), this shop belonging to Gail Silverton (sister of Nancy) acquired a Synesso Cyncra espresso machine in 2009 and procured beans from Sonoma County’s Ecco Caffe. The baristas do a fine job with the machine and the coffee. The highlight is when Gail’s son, Nik Krankl, is in town and pops up behind the counter. Krankl is an award-winning barista, most recently competing in the Southwest Regional Barista Championship. Keep an eye on Gelato Bar’sFacebook page for updates on Krankl’s guest shifts. 4342 1/2 Tujunga Ave., Studio City; (818) 487-1717; http://gelatobar-la.com. World Coffee Events Ltd in mid-March announced that the new World Brewers Cup will bring to five the number of World Championship coffee contests to be held at the SCAE’s World of Coffee event In Maastricht, June 22-24. The World Latte Art Championship, the World Cup Tasters Championship, the World Coffee in Good Spirits Championship, the World Cezve/Ibrik Championship, and the debut of the World Brewers Cup, represent five of the premiere events in the global speciality coffee industry. “These competitions, which celebrate the best of the best, provide inspiration and recognition to coffee professionals worldwide, and ultimately translates into more exceptional offerings for coffee drinkers” said World Coffee Events Managing Director, Cynthia Chang. Premiering at this year’s event is the World Brewers Cup (www.worldbrewerscup.org), a brand new contest of hand-crafted filter coffee brewing skills. Competitors from around the globe will compete to strive to produce perfect filtered coffee beverages, utilizing the artisan brewing methods of their choice. In the first round of competition, entrants are evaluated purely on the taste of the cups, all produced from a single supply of whole-bean coffee. The top scores move on to the final round, where they prepare and serve their coffees in a sommelier-type presentation. The World Brewers Cup is an exciting new event that will be especially engaging for spectators, as they can sample the same coffees being served by the competitors as they present them to the judges. The World Latte Art Championship (www.worldlatteart.org) highlights the art and craft of latte art: patterns and designs made atop cappuccino-style beverages. A series of challenges face each competitor, involving producing a set course of drinks, as well as a free expression of creativity, all judged on beauty, symmetry, and displayed mastery of skills. Spectators are able to examine the art along with the judges, making the World Latte Art Championship an audience favorite. The skill of distinguishing different coffees by tasting is on display at the World Cup Tasters Championship (www.worldcuptasters.org). Competitors are ranked by accuracy and speed in a series of triangulation tests. In a triangulation, the taster evaluates three cups of coffee, seeking to identify the odd cup. The combinations increase in degree of difficulty, sometimes as challenging as distinguishing coffees from the same country but a different growing area. The cups are then unveiled group by group in a suspenseful and entertaining way. The World Championship of Cezve/Ibrik (www.ibrikchampionship.org) celebrates the time-honoured practice of Ibrik (also known as Cezve) coffee traditions. Competitors prepare and serve three different sets of beverages, all the while performing an engaging presentation for the judges; it is truly a competition that combines wonderful tastes and experiences. Scores are announced as they are tabulated after a fun and appealing competition for all. Finally, the World Coffee in Good Spirits Championship (www.worldcoffeeingoodspirits.org) brings together the craft of coffee with that of mixology, as entrants prepare rounds of cocktails combining coffee with spirits and liqueurs to determine the best coffee mixologist in the world. Competitors prepare traditional Irish Coffees and a unique creation of their own to a pair of judges. Spectators are able to learn the recipes as well during the presentations that are traditionally enjoyable and appropriately light-hearted. These five world competitions, together with the other activities at SCAE World of Coffee–the Exhibition, Workshops, Awards and Social Programme–make Maastricht 2011 the pre-eminent event of the global speciality coffee year. Further information, including the rules of each contest, can be found at the WCE website (www.worldcoffeeevents.org). The successful 2011 edition of the Hellenic Coffee Championships attracted over a thousand attendees to five different national competitions held at the HO.RE.CA exhibition in Athens in mid-February, the SCAE’s Greek National Coodinator Nikos Psomas reports. The four-day event, sponsored by the exhibition itself along with Taf Coffee and Easy-Delta, attracted close to 50 competitors to the various competitions, and brought a slate of new champions for the World Championships in Maastricht and in Bogotá. Stefanos Domatiotis of Taf Coffee is the 11th Hellenic Barista Champion, and will represent Greece at the World Barista Championship in Colombia in June. Giannis Galiatsatos of Mokka Speciality Coffee came second and Giorgos Kontorinis, also from Taf coffee, placed third. Fourth, fifth and six places went respectively to Alexandros Foukis, Kostas Sideris of Red Coffee Roasters and Nikos Doukakis. In the 3rd Hellenic Cupping Championship, the winner was Kyriakos Ouzounidis, with Gerasimos Saridakis coming second and Kostas Paipetis of Mokka Speciality Coffee, third. Christos Loukakis of Taf coffee won the 5th Hellenic Latte Art Championship, with Eduard Hayrapetian taking second place and Nikos Doukakis third. Dimitris Papaioannou was the winner of the 5th Hellenic Coffee in Good Spirits Championship, with Tasos Moschopoulos coming second and Kostas Arapoglou taking third place. And finally, the 4th Hellenic Ibrik Championship as won by Kostas Arapoglou, assisted by Dimitris Poulos. Second place went to Giannis Pantazopoulos and third place was taken by Kyriakos Ouzounidis, with the assistance of Nikos Margaritopoulos. The Head Judge for the Championships, Brent Fortune, was assisted by fellow judges Lauro Fioretti and Alf Kramer. The organisers of this year’s Championships thank the sponsors, as well as supporters Mokka Speciality Coffee, El Cafe and Rosetti Caffe. Pictured above is the 2011 Greek Barista Champion, Stefanos Domatiotis. To see a full gallery of images from the Hellenic Coffee Championships in Athens on the SCAE Hellas Facebook page, click here. Specialty coffee, also known as gourmet or premium coffee, is made of high quality coffee beans, grown under ideal conditions, in climates perfectly suited to coffee plant growing. It features unique and distinctive tastes that usually reflect the qualities and characteristics of the soil and region that produces it. Specialty coffees are also partially defined by their existence not as commercial coffees. Specialty coffee producers are committed to offering quality, taste selection, and freshness that is not seen in commercial coffee manufacture. The consumer’s ability to buy whole beans, coffees from varying single origins, or special blends is unique to specialty coffee. Ultimately, specialty coffee is about offering the highest quality and freshness possible. A specialty coffee roaster buys only the best grades of coffee: high grown mild beans, carefully prepared, which display excellent cup quality. When you drink specialty coffee, you will undoubtedly taste the difference in quality that exists at every level of the coffee production process. Perhaps the greatest advantage to buying whole bean coffee is its freshness. Most experts estimate that once roasted, whole beans retain their flavor and aroma perfectly for about one week. After two weeks, the coffee still tastes great, but the aroma begins to suffer. After a month the taste profile and aroma significantly decline. Coffee is best when drunk within two weeks of roasting. Unfortunately, once ground, coffee begins to lose both flavor and aroma almost instantaneously. Ground coffee retains this flavor and smell only for a few hours. To enjoy the highest levels of flavor and aroma, it is imperative that coffee be sold as whole beans, ground within two weeks, and consumed immediately after grinding. Specialty coffee offers a wide variety of flavor, origin, and roast options. Whether through single origin choices, unique blends, or varying roast profiles, specialty coffee roasters are committed to providing as many selections as possible. Looking for a winey coffee, with a crisp acidity? A specialty roaster might suggest a Ethiopian Yirgacheffe. Interested in a chocolate-flavored, fruity coffee, with a berry aftertaste? The same roaster would steer you towards a Guatemala Antigua. Specialty coffee roasters possess both the expertise and necessary green beans to produce distinctive, complex flavors that can satisfy any palate. When ordering specialty coffee, you can choose a flavor based on the time of day, your accompanying food, or even your mood. These are options unique to specialty coffee. It is impossible to make a great product without extreme attention to detail at every level of production. Specialty coffees are always made up of entirely Coffea arabica, the most flavorful, complex, and aromatic strain of the coffee plant. They are generally cultivated in high altitudes, always at least 600 meters above sea level, and usually over 1,000 meters. The coffee beans are picked selectively, as they ripen, ensuring only beans that are ready enter the production cycle. They are carefully processed, dried, packaged and shipped. The expertise of the roaster ensures they are roasted to a level perfectly suited to each origin’s individual characteristics. Finally, when blended, they are mixed with precision and knowledge, accentuating and balancing each bean’s qualities. This attention to detail is wholly unique to the specialty coffee industry. “Specialty coffee” was first used in 1974 by Erna Knutsen in an issue of Tea & Coffee Trade Journal. Knutsen used this term to describe beans of the best flavor which are produced in special microclimates. Specialty coffee is the term commonly used to refer to “gourmet” or “premium” coffee. According to the Specialty Coffee Association of America (SCAA), coffee which scores 80 points or above on a 100-point scale is graded “specialty”. Specialty coffees are grown in special and ideal climates, and are distinctive because of their full cup taste and little to none defects. The unique flavors and tastes are a result of the special characteristics and composition of the soils in which they are produced. This is the first in a series of instructional videos by Intelligentsia Coffee to enable everyone to prepare excellent coffee in their own home. In this video we feature the Chemex Brewer and the music of Mucca Pazza (mucca-pazza.org). Enjoy, and happy brewing. After three days and hundreds of cups of coffee (espressos, cappuccinos and specialty drinks, including one served with lamb chops) made by 36 contenders from seven states, Pete Licata of Honolulu Coffee Co. emerged the winner of this year’s South West Regional Barista Competition. Nikolas Krankl, who was registered as a representative of Gelato Bar & Espresso Caffe in Studio City and Los Feliz, placed second. And Jared Truby of Verve Coffee Roasters in Santa Cruz took third. Six finalists competed Sunday — the top-scoring baristas culled from rounds held the previous two days at Siren Studios in Hollywood, where a crowd of fans cheered on Licata, Krankl, Truby, Sara Peterson of Verve, Kevin Bohlin of Ritual Coffee Roasters in San Francisco and Row Aczon of Honolulu Coffee. Each barista is scored by a panel of seven judges based on technical and sensory criteria. To name a few: how much coffee is spilled during grinding; whether extraction times for espressos are consistent (within a three-second variance) in each category; how much milk is left in pitchers after cappuccinos are made; the color of the espresso’s crema; the consistency of the cappuccino foam; and whether the espresso was a balance of sweet, acidic and bitter; among many other criteria. The six barista finalists will be entered in the U.S. Barista Championship, which takes place in Houston from April 27 to May 1. The world championship will be held in Bogota, Colombia, in June. Chris Baca during the first round of the Brewers Cup. Pete Licata, ready for the finals Sunday. Nikolas Krankl grinds coffee for his espressos. Chris Baca gets a hug from 2010 World Barista Champion Mike Phillips of Intelligentsia. Graeme Stewart had worked, learning his craft, in a busy family owned coffee shop. A dedicated student of all things ‘cafe culture’, he became fascinated by the growth in latte art and the wonderful patterns that could be produced on the crema of the coffee. He found it a very difficult art to truly master, as even slight variations can affect the end result. That is why coffee shops, if they want return custom, spend considerable sums of money sending staff on the type of courses Graeme had attended. It was then that Graeme transformed his finely honed techniques into an innovative product, one that would automatically spin the milk correctly – every time! By adding a stainless steel tube to the centre of the milk jug, he discovered that the desired spinning effect was routinely achieved, without the need for skilful tilting, to prevent the milk ‘bubbling up’. Graeme still had one problem left to overcome however – that of knowing when the optimum temperature of the milk had been reached. If the milk is heated beyond 150 degrees it will become caramelised and the coffee ruined. On the courses he’d attended he had been encouraged to ‘listen for the right sound of the milk!’ Graeme believed there had to be a simpler, more effective method; and so he designed an easy to use audio digital thermometer, that sounds when the optimum temperature of the milk is reached. So finally here was a solution to give any coffee shop a good reputation for delivering perfect coffee, consistently, regardless of who made it. Further, not only is the jug perfect for making lattes and cappuccinos, but also great for hot chocolate, or other milk based drinks. Hence the product name: ‘Milk to Perfection’ – because that is what this jug delivers, without the need for costly training courses. The Milk to Perfection jug is now available to purchase. The price is just £19.99 for the 20 ounce jug and £24.99 for the 32 ounce jug. To make a purchase, either click here or click on the image at the bottom of the page. It is not talking about cream, sugar, ice-cream. Here are nine more surprising additions for those looking for a way to give that cup of coffee a little extra spicy. Cardamom - A spice that's commonly added to coffee in the Middle East, cardamom gives coffee a bit of an exotic flavor. Sprinkle ground cardamom into a cup of brewed coffee, or add a few whole cardamom seeds to your beans before you grind them. Cinnamon - If you're a regular cream and sugar person, you may want to consider switching up your routine and adding cinnamon instead. Butter. The idea, inspired by traditional Tibetan yak butter tea, is that adding butter to your morning drink boosts energy. Booze - While you may not want a shot in your coffee first thing in the morning, adding alcohol to coffee is nothing new. Vanilla Extract - If you like to sweeten your coffee, you don't need to depend on sugar and processed creamers. Try a few drops of pure vanilla extract instead. For example, at Marky's (Gourmet store in Miami) the cost of bottle 33oz is about $50.00. For a different taste, you can also try almond extract.